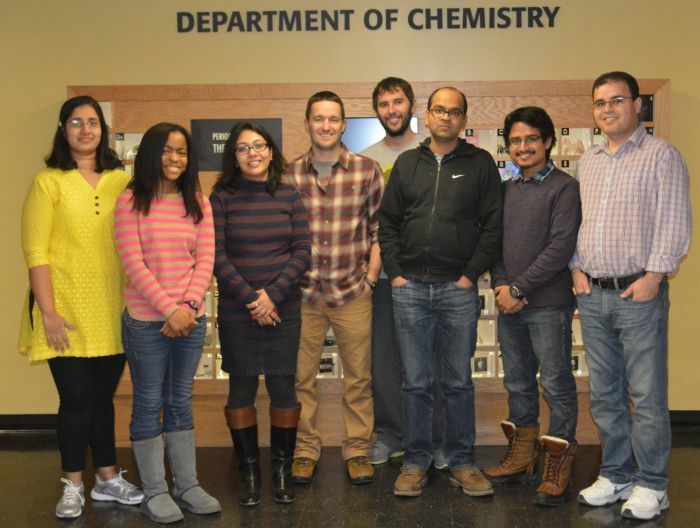 Welcome to the Dey Lab at the Department of Chemistry, The University of Iowa. Our research interests lie at the interface of chemistry and biology and we are investigating the molecular mechanisms of metalloenzymes important for bioenergy conversion, human health and disease, or environmentally valuable. We apply a combination of enzymology, biochemistry, microbiology, molecular biology, and structural techniques to probe biological processes on a molecular level. Our research is highly interdisciplinary, drawing from synthetic chemistry, protein biochemistry, biophysics, and microbial bioprocessing. 11/28/2017 Congratulations to Dhiraj and Ali on acceptance of their paper " Structural Investigation of a DImeric Variant of Pyruvate KInase Muscle Isoform 2" as a Communication in Biochemistry. 10/17/2017 Congratulations Suparno for winning the Director award for his poster at the 26th Biocatalysis and Bioprocessing Conference of the University of Iowa. 10/14/2017 Suparno is presenting a poster in 37th Midwest Enzyme Chemistry Conference, Loyola University, Chicago. 10/05/2017 Congratulations to Nick and Ali on acceptance of their paper " Bacillus anthracis Prolyl 4-Hydroxylase Interacts with and Modifies Elongation Factor Tu" in Biochemistry. 07/23/2017 Congratulations to Mishtu on her review article on "Enzymology of Microbial Dimethylsulfoniopropionate Catabolism" in Advances in Protein Chemistry and Structural Biology. 05/16/2017 Congratulations to Nick and Saumi on acceptance of their paper "Structural and Biochemical Insights into Dimethylsulfoniopropionate Cleavage by Cofactor-Bound DddK from the Prolific Marine Bacterium Pelagibacter" in Biochemistry. 04/27/2017 Saumi & Suparno passed their comprehensive exams! Congratulations!! 12/15/2016 Congratulations to Nick and Adam for their thesis defense. 10/18/2016 Congratulations to Adam on acceptance of his paper "New Mechanistic Insight from Substrate and Product Bound Structures of the Metal-dependent Dimethylsulfoniopropionate Lyase DddQ" in the ACS journal Biochemistry. 10/18/2016 Congratulations to Saumi for winning Usha Balakrishnan poster award at the 25th Biocatalysis and Bioprocessing Conference, University of Iowa. 10/01/2016 Saumi is presenting a poster in 36th Midwest Enzyme Chemistry Conference, University of Illinois, Chicago. 08/12/2016 We congratulate Ali and Mahsa for their marriage. 07/23/2016 Nick is presenting a poster in American Crystallographic Association Conference, Denver, Colorado. 05/31/2016 We welcome Valerie Welch for her summer internship in Dey Lab! 04/29/2016 Ali has been selected as a Department of Chemisty Graduate Fellow for the summer of 2016. Congratulations Ali! 04/21/2016 Congratulations to Nick for his J.Biol.Chem. paper! 03/17/2016 Saumi has been selected to receive the University of Iowa Graduate College Summer Fellowship in Radiochemistry. Congratulations Saumi! 03/14/2016 Congratulations to Dhiraj and Shipra on welcoming two new members, Nyrika and Achinthya, to the group! 03/11/2016 Congratulations to Nick on acceptance of his paper - Structural analysis of cofactor binding for a prolyl 4-hydroxylase from the pathogenic bacterium Bacillus anthracis in Acta Crystallographica Section D.
03/01/2016 Mishtu is invited to submit a Current Topics article to the American Chemical Society journal Biochemistry on the topic of "Redox metallobiochemistry”. 12/08/2015 We welcome our first year graduate students Alexis, Suparno and Saumi to the Dey group! 10/25/2015 We congratulate Nick and Stephanie on their marriage! 08/18/2015 Mishtu was invited to present at The Young Investigator’s Symposium of the Division of Biological Chemistry at the 250th ACS National Meeting. 06/10/2015 Mishtu has received a NSF-SusChEM grant. 05/14/2015 Congratulations Ali for passing his comprehensive exam! 04/16/2015 Congratulations to Adam for his paper. 04/02/2015 Adam received 2015 Ralph Shriner Summer Fellowship from Department of Chemistry, The University of Iowa. Congratulations Adam. 03/07/2015 Congratulations Nick for receiving the NRC Graduate Fellowship for 2015-2016! 02/15/2015 Congratulations Adam for receiving graduate student travel award to attend 249th National ACS conference in Denver, Colarado. 10/31/2014 We congratulate Qi for receiving his Masters degree. 09/27/2014 Adam and Qi will be presenting posters at the Midwest Enzyme Chemistry Conference in Chicago. 04/29/2014 We welcome our first year graduate student Ali to the Dey group. 03/20/2014 Nick has been awarded a Graduate College Summer Fellowship for Summer 2014. Congratulations Nick! 03/26/2014 Congratulations to Mishtu and Ryan on welcoming baby Rishym to the group! 10/30/2013 Congratulations Nick for passing his comprehensive exam! 10/21/2013 Adam will be presenting a poster during the 22nd Annual CBB Conference. 08/31/2013 Adam receives the Meryl Heltibridle Graduate Fellowship. Congratulations Adam! 06/02/2013 We congratulate Dhiraj and Shipra on their marriage! 05/09/2013 James is one of the three recipients of the Viksnins, Harris, and Padys poster award for presenting his work at the Spring Undergraduate Research Festival. 05/09/2013 Qi receives the Rookie of The Year 2013 at the Chemistry Appreciation Night. 05/08/2013 Congratulations Alex for graduating with honors. 04/29/2013 We congratulate Alex for receiving The Merck Index Award and James for The American Institute of Chemists award from the department of chemistry . 04/26/2013 Nick receives the Outstanding Teaching Assistant Award. Congratulations Nick! 02/14/2013 We welcome Dr. Dhiraj Sirvastava to our research team! 12/11/2012 Adam Brummett and Qi Liu join our lab. Welcome to the Dey Lab! 10/16/2012 Alex, James, Steve, and Nick will be presenting posters on their work during the 21st Annual CBB Conference. 10/13/2012 James and Nick will be presenting posters at the Midwest Enzyme Chemistry Conference in Chicago. 08/06/2012 We welcome Dr. Khurshid Khan to our lab! 05/15/2012 James Latanski joins the lab. Welcome James! 05/10/2012 Steve receives the Merck Index Award at the Chemistry Appreciation Night. 04/30/2012 Daniel Lohse joins the lab. Welcome Dan! 04/24/2012 Steve receives the ICRU Research Fellows Scholarship for summer 2012. Congratulations! 04/23/2012 Steve receives an undergraduate award from the Department of Chemistry. Congratulations Steve! The Dey Lab is always interested in hearing from enthusiastic graduate students and postdocs. Interested students should contact Dr. Mishtu Dey at mishtu-dey@uiowa.edu. We are affiliated with the MCB program, Biosciences Program, and the Center for Biocatalysis and Bioprocessing (CBB).